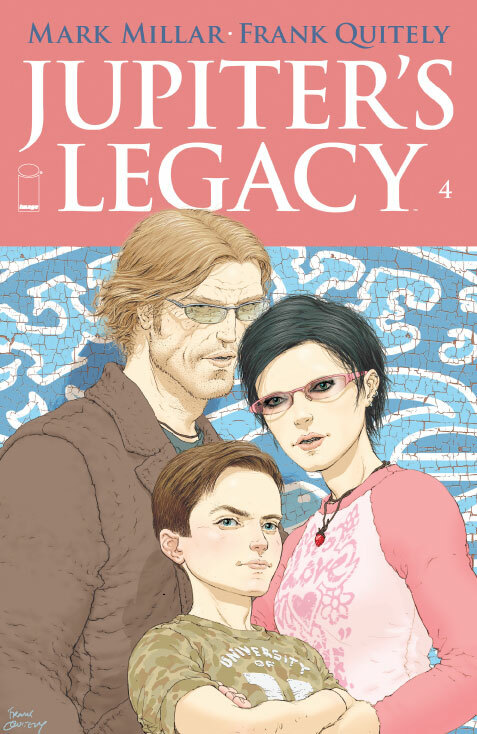 We have another joint review for you today, as both Chris and Ross wanted to take a look at the eagerly-anticipate fourth issue of Jupiter’s Legacy. And on the subject of Jupiter’s Legacy, BBC4 are showing a short documentary about a day in the life of Glaswegian artist Frank Quitely, which should definitely make for some entertaining viewing. You can check it out on BBC2 tonight at 10 o’clock (if you’re in Scotland), or on BBC iPlayer shortly after. Well worth a look. It’s not going to take that many words to sum up why this book is awesome, so i’ll keep it brief to give you more time to go out and buy it. The book opens with a familiar comic writing tool – the “Jump Forward” – which while can seem like a cheap Deus Ex Machina when used by certain other publishers,. However, in the hands of Millar, it gives the book another fresh start without it seeming jarring that there’s a big chunk of story missing. Millar’s ability to create worlds that make perfect sense from the get-go is a rare skill and makes this story just seem like a natural progression from issue 3’s cliffhanger ending. The use of a dystopian future, while overused to the point of saturation these days, doesn’t even put me off as Millar has literally created a world – with parts of the story set in the Land of Aus, as well as in the good ole’ U. S of A – which is nice for once. Then there’s Frank Quitely’s art. What more is there to say other than he manages to make the book look effortlessly perfect. He’s managed to perfectly capture the feel of the book and his precise line work and the overall expressiveness of his work makes the book not only beautiful, but gives a greater impression of the matter at hand. My only gripe of the book is the massive wait between issues, but that can’t be helped and can just be added to the pile of “but it’s comics, right?” However, trust me when i say this book is worth the wait and a fantastic read from beginning to end. Do yourself a favour and not only pick it up, but read all 4 issues in the one sitting. You can thank me later. Issue 3 of Jupiter’s Legacy was always going to be a tough act to follow, given that it ended establishing a new status quo for its characters, as well as featuring two absolutely stunning splashes from Frank Quietly that’ll be tricky for anyone to beat, let alone its follow-up issue. But follow-up they must, and given the circumstances, issue 4 manages to not feel anti-climatic, successfully capitalising on the tension and rifts in the Sampson superhero family, as well as filling us in a little further on the backstory of how they originally acquired their powers. All the while, it’s realigning itself, clearly readying itself for further altercations down the line. Once again, the highlight of the piece is Quitely’s baffling good line art. He’s not the subject of an episode of a BBC documentary series for no reason – the man captures motion, as well as subtle facial expressions, in a way which few other artists can even hope to emulate, able to make even the most mundane of expeditionary dialogue feel akin to an action sequence. His art has a simultaneously grounded, and yet other-worldly air to it – a trans-dimensional glimpse into an alternate Earth that’s similar, but not quite the same as our own. Millar’s writing – particularly his world-building – remains strong, even if it pulls from literally every single superhero story that ever preceded it. It’s harsh to call it derivative, however – it’s hard to not be when you’re trying to toy around with established tropes, and there’s fun to be had in the ironic little subversions that Millar peppers throughout. As far as holding patterns go – and this is at that, the pot waiting to come to boil once more in issues 5 and 6 – this is still pretty entertaining stuff, though on its own, this issue probably ends up raising more questions than it answers. Forgivable, given we’re less than half-way in, and thanks to that art. This series is turning in to something of a belter.